The Deep South's Oldest Rivalry between Auburn and Georgia has, in some ways, been college football's most fascinating. The Deep South's Oldest Rivalry between Auburn and Georgia has, in some ways, been college football's most fascinating. Remarkably, a series dating back to 1892 is seperated by just two wins and 110 total points, with the Bulldogs holding slight 58-56-8 and 1,998 to 1,888 advantages. Even last season, the two powers split a pair of meetings; the Tigers won game one 40-17, with Georgia claiming an SEC Championship Game rematch 28-7. Even in a year where neither contest was competitive, the final total margin was still just two points. Similarites far from start there. Auburn has 12 all-time conference championships, two national titles, three Heisman Trophy winners and 30 consensus All-Americans, while Georgia has 15 conference championships, two national titles, two Heisman Trophy winners and 33 consensus All-Americans. In addition to The Tigers and Bulldogs being one of the longest-tenured rivalries in sports, they will soon play each other for the third time in less than a calendar year. Given that Auburn University is located just over 30 miles from Georgia's third-largest city, Columbus, this rivalry is rooted in prestige and proximity. 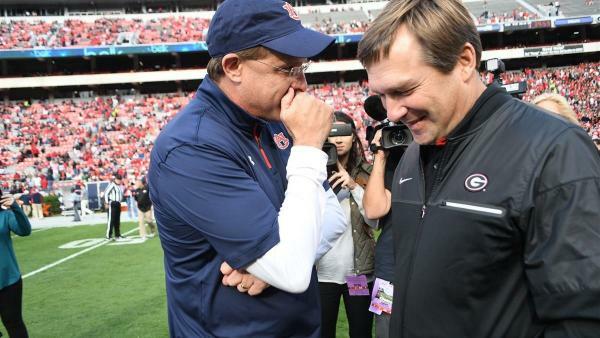 Whenever the two programs do meet in Atlanta for the SEC Championship Game, it's as much two alumni reunions as it is a football clash. This series has a history of wild unpredictability. In 2013, before the magic of the "Kick Six", there was the "Prayer at Jordan-Hare". On 4th-and-18 for the Tigers, Nick Marshall completed a 73-yard heave, one that was first deflected by a defender, to Ricardo Louis for a late game-winning touchdown. Auburn's quarterback Marshall started his college career as a defensive back at, of all places, Georgia. Other recent highlights include David Greene's toss to Michael Johnson for an inprobable final score for the Bulldogs on a 4th-and-15 in 2002 and, in 1996, the first-ever overtime game in SEC history. The storylines for this Saturday center mostly around Georgia. Having already clinched the SEC East, the Bulldogs, fresh off wins over highly-ranked Florida and Kentucky, have their sights set on a potential College Football Playoff bid. In what will be a primetime showcase, Georgia better be focused on the task at hand, however. Auburn has now won at Ole Miss and beaten Texas A&M in comeback fashion following a mid-season lull. Finding some late momentum, the Tigers scored two touchdowns over the game's last 5:14 to top the Aggies. As usual, Auburn-Georgia will likely come down the line of scrimmage. The Bulldogs lead the league with 233.8 yards per rushing per game, while the Tigers have compiled the most tackles for loss in the conference with 78. D'Andre Swift and Isaiah Holyfield, fresh off 271 combined yards for UGA in Lexington, form an elite tandem. Derrick Brown and Nick Coe anchor a Tiger line that is one of the best around. Though the SEC Championship Game is already set, Saturday's outcome will impact the national scene. Who knows what to expect when Auburn and Georgia meet up. In a rivalry that has seen it all, one game can be quite the story.